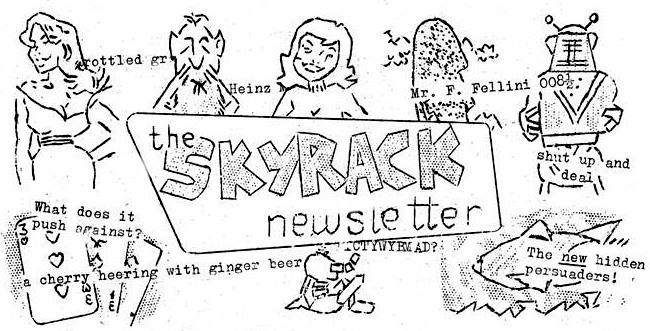 This is SKYRACK 65, dated 2nd April 1964 and edited by Ron Bennett, 17 Newcastle Road, Wavertree, Liverpool 15, England. 6d per copy. 2/6d for 6 issues. 35¢ for 6 issues in USA (6 issues sent airmail for 70¢), where subscriptions may be sent to Robert Coulson, Route 3, Wabash, Indiana 46992. News of interest to science fiction fans always welcomed. THE SIXTH ANNUAL CONVENTION OF THE BRITISH SCIENCE FICTION ASSOCIATION was held at the Bull Hotel, Peterborough, Northants., from Good Friday, March 27th to Easter Monday, March 30th. This was the second successive year that the Annual National had been held at the Bull and virtually the same number of fans attended this year as did last, 125 with a SEm of 3 points! Once again there were many new fans present, though this year the professional turn-out was somewhat disappointing, not only when compared with last year’s all-time record. Under-programming allowed plenty of time for mixing socially and permitted eating under relaxed conditions. Congratulations and many thanks to organisers Ethel Lindsay and Chairman Tony Walsh for a very fine weekend. In suspended animation since the early Kettering conventions, the phantom quote card distributor struck again this year. Under every beer-mat, in every toilet roll, along corridors, in sandwiches… there were quotecards. In the main, these fell into three categories: those supporting Phil Rogers in the current TAFF campaign, those featuring a saying or, er – a quote, and those which could be flashed in conversation or could be otherwise be used appropriately in certain naturally-occurring situations. The cards were contrived by the Liverpool Group, illustrated by Eddie Jones, duplicated by Norman Shorrock and complained about by Alan Rispin. There were some ten thousand cards distributed in all, of which no fewer than one hundred and ninety-four were different. How many did you collect? THE CONVENTION was opened a few minutes late on the Friday evening by Tony “I believe in tradition” Walsh who welcomed attendees and introduced his committee. Various notable fans and authors present were interviewed by Ethel Lindsay who found the tables turned when she tried to interview James White. Ken Slater followed by giving an impromptu answer session to snap questions on s-f. This was a little disappointing in that many fans deliberately went out of their merry ways to catch Ken out, though when Ken asked for questions which perhaps posed some problem to the questioners themselves, the session was far more enjoyable and definitely more worth-while. Ask the young lady who discovered for the first time the title of a memorable story which she had come across in a pocket book lacking a cover and title page, namely "The Puppet Masters”. THE SATURDAY MORNING PROGRAMME opened at ten with a panel discussion on the topic, Does Fandom Need Science Fiction? Surprisingly the panelists themselves, Chairman Ron Bennett, Arthur Thomson, Phil Rogers, Terry Bull and TAFF delegate Wally Weber, showed up as being anything but the experts they are reputed to be and decidedly the majority of speeches came from the floor where also the main points were raised. Phil Rogers felt that fandom does not need sf. Terry Bull pointed out that sf brings fans together but after the initial meeting their interests widen out. Arthur Thomson finds that sf needs fans and fans need sf. Wally Weber said that fandom needs sf as a recruiting device. Ken Bulmer noted that sf editors can run into trouble if they take notice of fans, the shrill minority, which caused Atom to note that if fans are the shrill minority then the authors are the shill minority. George Scithers who was on the Committee of last year’s Washington D.C. Worldcon (the DisCon) and who is now stationed in Germany, noted that fandom has been a source of providing many professional authors to which Ken Bulmer stated “Your innocence has gone forever once you have made a sale.” Ron Bennett reminded the audience that one reason for the founding of the BSFA was to recruit fans for fandom. Jeff Cooper from Cambridge noted that present day sf lacks the literary elan of the sf of the late thirties and James White rightly pointed out that there would be no fandom at all were there no sf to begin with. Charles Platt said that fans are boring when they don’t talk about sf. Phil Rogers felt that there was more to fandom than this. He enjoys reading westerns but he wouldn’t join a western club, therefore he must have joined a sf club for more than sf. Ken Bulmer pointed out that the attitude of a fan who had read much sf is different from that of a neo who is reading sf for the first time. He asked what the newcomers felt about present day sf. John Mejer said that sf fell into different schools but that it was interesting to see the old timers weep every time Gernsback was mentioned. Jeff Cooper said that Naomi Mitchison’s “Memoirs of a Spacewoman” is banal and abysmal, to which Ken Cheslin did not altogether agree. George Scithers noted that the con audience did need sf because they were actually talking about it. Phil Rogers remembered that old sf employed strange terms. Now that he understands this terminology, something has gone, the golden glow, the mystique… but Ted Tubb felt that readers read not to think but for entertainment and that present day sf is trying not too successfully to appeal to a mass audience. George Scithers felt that the old terms, cybernetics, moons of Mars, etc, which caused the old golden glow, are now understood by the general public and that fact is catching up sf; there are fewer topics remaining to cause the old satisfaction. Terry Pratchett said that good sf is still being written. The discussion eventually ran out of time and was wound up by Ron Bennett who felt it had been proved that science fiction needed science fiction. SATURDAY AFTERNOON’S SURPRISE ITEM took the shape of Mr & Mrs Edmond Hamilton answering questions fired by the audience. Ed Hamilton said that the pace of Battle for the Stars was much slower than, say, The Universe Wrecker because it had been expanded from a short story. Leigh Brackett – yes, Mrs Edmond Hamilton (we, too, have neo-fan readers) – mentioned that Planet Stories was thought to be a poor magazine while it was running; the moment it folded people began to praise it. EH said that the pocket book is taking the place of the magazine. Both EH and LB felt that the pulp would never return. Asked about their first interest in sf, Ed said that he began to imitate Merritt's style through admiration and found that it sold. Leigh said that at school she was good at expressive work, tried pro writing at 13, didn’t sell for ten years. Ed felt that more factual work will be written. Jim Groves pointed out that more scientists are now writing sf. Ed answered a question from Ethel Lindsay, that his favourite self-written story was What’s It Like Out There? which was written in 1933 and sold thirty years later. Leigh likes The Long Tomorrow. Of each other’s stories, Ed likes Leigh’s The Fall of the Free Winds and Leigh likes Ed’s What’s It Like Out There and The Star Kings. Sid Birchby told of being given a copy of The Star Kings by Ted Carnell only to find that the book was the French edition. He bought a French dictionary so that he could read it and had thoroughly enjoyed it! John Roles asked about a Hamilton anthology which had appeared in the UK, The Horror on the Asteroid. Ed said that there was no US edition and that the book must be pretty rare by now. This collection of stories from Weird Tales had been his first hard cover book, though the royalties had been so small that he had been paid in postage stamps. SATURDAY EVENING found a bar erected in the con hall with home made brew provided by the Merseyside Winemakers’ Society flowing freely for all comers. The fancy dress competition was judged by Leigh Brackett, Edmond Hamilton and Michael Moorcock against the undersea theme backdrop which had been designed by a highly talented twelve year old, namely Ken Slater’s son. Susan Slater, Ken’s daughter, was determined not to be left out of the honours and carried off the prize for the most beautiful costume. Harry Nadler’s monster costume took the prize for the most BEMish costume, this for the second year in succession. The award for the best fantasy costume was won by Ian and Betty Peters for their representation of Fafhrd and the Grey Mouser. Phil Rogers won the prize for the best sf character in his guise as one of Vance’s Miracle Masters. Tony Walsh took the Judges’ Award but as he was on the Con Committee he felt that he could not really accept this so promptly awarded the prize to the judges! A good swinging fancy dress party. AT THE SIXTH ANNIVERSARY A.G.M. OF THE BRITISH SCIENCE FICTION ASSOCIATION held on the Sunday morning the new Committee for the forthcoming year was elected as Chairman: Ken Cheslin, Vice-Chairman: Roy Kay, Secretary: Rod Milner, Treasurer: Charles Winstone and Publications Officer: Roger Peyton. Thus for the first time since the formation of the Association a Committee is formed entirely from fans who have entered fandom since that very formation. The age for Committee members to hold office was dropped from 21 to 18. Ken Slater proposed a raise in subscription rates and Terry Jeeves asked whether an instalment system for paying dues might be practicable and might at the same time bring in a little extra money if deferred payments were on a slighter higher rate. The advertising situation was reviewed, as Nova, who have in the past donated adverts free, is no longer continuing and Roberts & Vinter are not including interior adverts. Ella Parker mentioned that at one time the BSFA was running a London Underground advert, the cost of which was a penny a day. Ken Slater said that he had had more information on books from one issue of Zenith than from a year’s supply of Vector, a point for the consideration of the new committee. Jim Groves, an ex-publications officer, volunteered to run the new information service and finally, the award was made of the annual BSFA trophy, namely the Doctor Arthur Rose Weir Memorial Award. No one was in the least surprised when the Award winner was announced as the richly deserving Vector editor, Archie Mercer, who thanked the audience and spoke of his own and fandom’s association with the late “Doc” in a short speech which was probably the weekend’s best. IT WAS SILENT SUNDAY for Skyrack editor Ron Bennett when an old throat complaint made an unwelcome reappearance at a most inappropriate time. On Good Friday morning I had woken up with a slight sore throat, but this quickly disappeared during the morning. It reappeared on the Saturday and during the day my voice began to tail off. I woke up on Sunday to find that I could whisper – if I shouted! The sore throat which had now disappeared came back again on the Monday, by which time my voice was beginning to return. On the Tuesday I was running a temperature and could neither talk nor stand. I’m now recovering both strength and voice, thanks, but if you find pillows, sheets, feathers or hot water bottles stapled in with this issue, you’ll know why. There are, it has been said, two types of fans, the talkers and the listeners. As it may possibly be said that I fall into the former category, it will probably be understood why this was not a particularly enjoyable convention day for me. Indeed, it was a somewhat disappointing convention as conventions go. Blame this, please, on my throat-coloured outlook and not the Con Committee if you disagree with me, as I’m sure you will. THE SORE THROAT had its funny side, however, for in the majority of cases when I whispered to someone, he would whisper back! At the BSFA AGM, Ken Cheslin bid for next year’s convention on behalf of the Birmingham group and Ethel Lindsay bid on behalf of myself for taking the con to Harrogate. This was lack of foresight on my part; I had declined to make a bid through Skyrack thinking that a) I’d save space and b) I would be able to put over the advantage of a holiday weekend far better in person. Ha! Voting took place during the day, the result being announced in the evening. Ladies and gentlemen, next year’s Easter convention will be held in Birmingham. The Committee and hotel (the Imperial?) will be announced later, but with over fifty members already registered, you are advised to send your registration fee of 5/- to Ken @ 18 New Farm Rd., Stourbridge, Worcs. as soon as possible. FILMS WERE SHOWN on the Saturday afternoon, the main feature being the fairly recent The Day The Earth Caught Fire which was supported by the very popular Goon vignette The Running, Jumping & Standing Still Film. On the Sunday afternoon the “Alien” group from Salford, Manchester, which was attending its second con., put on a show comprising the films made by the group since last year’s convention. Now, we’ve all seen amateur films before and we know how overplayed any story can be, how forced any would-be humour can be, etc etc. I’m happy to report that these films proved to be the exception to the generalisation. Some of the effects employed by the Group are superb and could well serve as a lesson for many professional companies. When the lights went up at the end of the show, I caught Ella Parker’s eye, which wasn’t hard because she was looking at me. We nodded enthusiastically and the upshot is that the Group will be showing some of their works at the London Worldcon in ’65, granted of course that our bid goes through. The Group also repeated the show here late at night by unanimous request and added a further item not included in the afternoon showing. LAN WRIGHT took the chair at the professional authors’ “Tribute to Nova” which naturally combined itself with a tribute to Ted Carnell. Wright told the audience of the beginnings of New Worlds as a fanzine which later became a prozine under Pendulum Publications which handled the first three issues. Of the pre-Nova authors, only William F. Temple is still writing today. With issue number 3 came the first of the Carnell encouraged writers, namely Francis Rayer. The following issue found Ernest James and Bertram Chandler in print for the first time, being followed in turn shortly afterwards by John Christopher and artist Gerard Quinn. Ted Tubb made his first appearance in New Worlds 10 with a 4,000 worder called No Short Cut. Wright himself had first sold with a story in number 13 and issue number 16 had seen the first New Worlds serial, M’Intosh’s S Worlds. Ken Bulmer had first appeared in issue number 23. Ted Tubb spoke of the manner in which Ted Carnell had gained a reputation for giving encouragement to new writers, by which he had gained the loyalty of those writers. Ken Bulmer supported this, saying that Carnell has done more for British fandom than anyone else. Carnell’s maxim has always been “Give the boy a chance and he’ll improve.” Also grateful to Carnell’s encouragement was E. R. James, who though unable to be present himself, sent a message for the Appreciation. Mike Moorcock, who has taken over Carnell’s New Worlds editorial chair after Carnell’s recommendation spoke of the strong bond between Carnell and his writers, and also of how Carnell had once written to cheer him about a story he had written; Carnell had said how much he had liked and enjoyed the story which had encouraged Mike immensely. Only later had he discovered that in fact Carnell had not liked the story! Lan Wright closed the 20 minute tribute with the good wishes for Carnell’s future ventures, coupled with success for Michael and New Worlds, a sentiment hearity echoed by the gathering. THANK YOU FOR CONVENTION GREETINGS you people who couldn’t attend. There were telegrams from Eric & Margaret Jones and from the entire LASFS. In addition Dave & Ruth Kyle phoned from New York, directing their call through Norman Shorrock. They deliberately left their call until 4pm Sunday as they guessed that at that time he would be out of bed. SUNDAY EVENING SAW GUEST OF HONOUR E. C. TUBB speak about his writing life and answer questions on the same. Ted said that these days publishers do not need new authors, but merely knock the dust off 20 year old novels and reprint them. He would take up editing again given the chance. There are but few full time sf writers now. Some writers are better when forced to write, some not. Selling a story depends on more than merely quality, Ted said, for example a 2000 worder is virtually a waste of time, however good. Ted told the packed hall that his happiest sf moment was his first sale in 1950 and that he had been translated in several languages. This was quite an informal chat, rather than a “speech” and personally I could have listened all night. TAFF DELEGATE Wally Weber set a new level in individual mixing. Wherever there was a programme item, a group nattering etc., there was Wally, complete with notebook and/or mini-tape recorder. Unobtrusively he got around and he ensured that he was not cornered by any one fan or group for too long a time. On two different occasions I saw him refuse to leave both a programme item and a group of neos to go off somewhere or other with bigger names. A very refreshing individual, as we well knew he would be. His report, I understand, will first appear in Cry. Wally stayed with Ella Parker and the Willises in Belfast before coming to the con. He followed Ron Ellik’s fine example of travelling from the con with Val and Terry Jeeves and it is believed that there is a chance that he will be visiting L’pool. THE CON PROGRAMME BOOKLET was quite a fine affair produced by Arthur Thomson. Chinese restaurants were again favoured by the majority of attendees, though the food in the hotel was greatly superior @ the same price. Michael Turner of Birmingham very nicely quipped to me, when the voting for the next year’s consite had been decided 27–26 in favour of Brum over H’gate, “I hear you voted 25 times for Birmingham.” Eddie Jones carried off the Convention’s art award, and the SFCoL art award was presented to Michele Jakubowovicz. Room parties were at a premium, though I did hear of one at which a bed had been moved out into a corridor… Last year much was said about fans who invaded room parties, drank liquor and left when the wine stopped flowing… So! George Locke and I toured corridors for two nights, laden with gin and looking for takers… c’est la guerre! CONGRATULATIONS to Jhim Linwood who married Marion Lansdale, Wed 25th March in Hampstead. The couple attended the con in quiet style without broadcasting the good news :: And congratulations, too, to Liverpool’s 18 year old John Ramsey Campbell, whose $4.10 story and 207 page anthology The Inhabitant of the Lake has just been published by Arkham House.